Make a worksheet with the questions posed after each step of the task to give students a place to write their answers. Some students may need a similar worksheet for the Basics section. 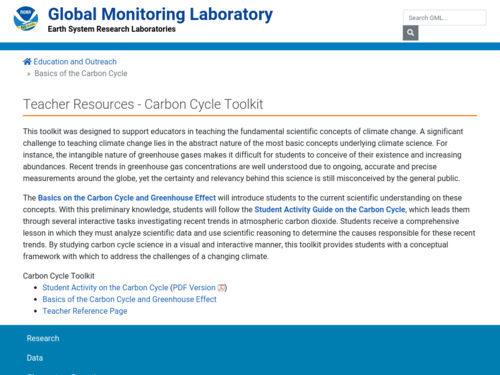 Educators may want learners to begin with an exploration of the visualization http://www.esrl.noaa.gov/gmd/ccgg/carbontracker/ to look for trends before they launch into the reading. Different locations can be assigned to different groups to reduce the repetitiveness of the activity as described. A very thorough look at actual data to explore the carbon cycle and trends in CO2 concentration at different sites. The "Basics of the Carbon Cycle and the Greenhouse Effect" web page consists completely of facts introducing the reader to the carbon cycle and the main sources of carbon dioxide in the atmosphere. The activity itself uses primary data measured at various sites around the world and draws from the databases that I will be using myself in a couple of weeks for my own research. I think that this makes this activity very powerful as students get to work directly with the data. It also makes students compare data from various locations and makes them realize that there are seasonal cycles as well as long term trends. Students can use the knowledge they learned from the basics page to understand the observations. More structure may be necessary for some students when reading the Basics of Climate Science. There is no space or opportunity to write the answers to the questions posed during the activity. Tasks are clear and easy for students to follow; screen shots are helpful. A long reading kicks off this activity but it is well done. The visualization is strong and fairly ease to use. The directions given to learners are clear and should be easy to follow. Easy for students to follow directions to find and analyze data.